“Home is all she’s ever known and all she needs for happiness. But life after the Return is never safe and there are threats even the barrier can’t hold back. Earlier in the year I read The Forest of Hands and Teeth, by Carrie Ryan, and really enjoyed it. I’ve only just got around to reading its sequel, The Dead-Tossed Waves, but it’s just as good. 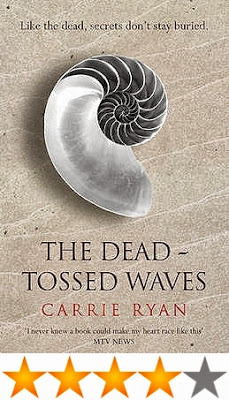 Unlike a lot of sequels, The Dead-Tossed Waves is about the next generation rather than an immediate continuation of the previous book, and follows Gabry, rather than her mother Mary, the heroine of the first book. Gabry lives in Vista, a city by the sea, surrounded by a barrier that keeps the Mudo (zombie-like creatures) out, and the citizens in. One night, Gabry and her friends cross the barrier into an old, abandoned theme park just for a bit of fun…and they attacked. Some of her friends are bitten and turned, a few die, and the rest get caught, while she runs for her life. The story follows Gabry, as she tries to come to grips with the fact she left her friends to get caught and punished for going over the barrier, the fact that the only boy she thought she could love was bitten, the fact that her mother was holding back secrets about the Forest and her own past that could change Gabry’s life. As a promise to her best friend, Cira, who is now behind bars, Gabry goes back over the barrier to try and find out what happen to Cira’s brother, Catcher, and when she does she meets Elias, a young man who lives on the outside. Gabry’s life is really in danger after these trips over the barrier, and the life she thought she could once have goes out the window. Written in first person, from Gabry’s perspective, it is well written, and has an easy feel to it. It’s fast paced, and rarely has a dull moment. Having said that, it did take a little bit of time for me to get into it, but I think that was just me and my tiredness, and not the book. With zombies and cult-like-groups, friendship and love triangles, secrets and lies, death and new life, a reappearance of a character or two from the first book, The Dead-Tossed Waves is a really enjoyable read, and a great sequel to The Forest of Hands and Teeth. I’m looking forward to reading the next book.